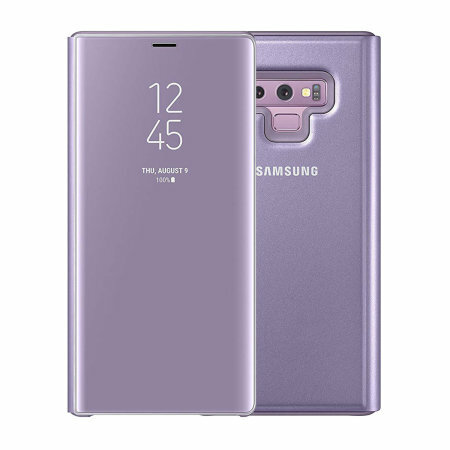 This Official Samsung Clear View Cover in lavender is the perfect way to keep your Galaxy Note 9 smartphone protected whilst keeping yourself updated with your notifications thanks to the clear view front cover. Great Samsung Original cover. You get what you pay for. Turns off when you close cover. Non Samsung covers do this! Product was of good quality. Took approximately 10 days to deliver. My 2nd order. It was a hassle-free purchase. Lovely case and it was exactly as per its description. Delighted with it Quick and efficient delivery. Love my phone cover, specifically made for Samsung Note 9 and very cool features no other phone cover can provide. As for buying from Mobile Zap....easy to find online, easy to purchase, fast delivery and just what I wanted. I wasn't able to buy in a store so purchasing online was the easiest solution. Original product,fits phone like a dream,stylish protection with a very useful stand. I love it so much I bought 2 one for work one for leisure. Looks really good with the mirror case, nice colour, good quality and fits well. Bought the blue cover for my Hubby. Unfortunately his case got scratched after a couple of days, but to be fair his work is hard landscaping, the cover is not suitable to protect the phoned in this working area. My cover is still good as new . Love it . The product received was as described. Great Service and Product. Come in original Samsung Packaging. I have bought 4 cases for my S9 note. If I had started with this on I would only have bought one. Just as described. Spot on case and service. Thank you. These cases are strong.Love the colour and see through and the corner are cover.And I will buy another one. Item is as advertised and the colour is lavender which is what I wanted. It arrived on time and I am happy with my purchase. This protects the phone really well and the colour match to the lavender Samsung note 9 is spot on. A very snug fit and the reflective case that allows you to answer the phone without opening the cover works perfectly. The rubber protection for the case is discrete and the strength of the fold aspect of the case has considerable longevity. Colour is very eye catching and commented upon - nice once Samsung! Very good product. The best quality you can buy. We'll buy from you again. THIS IS THE BEST CASE I HAVE EVER BOUGHT FOR A PHONE HANDS DOWN. A BIT PRICEY BUT WORTH IT TO PROTECT MY PHONE. Really nice case bit dear but well worth it! I thought I would be able to see texts etc up on screen, but it just gives you a symbol. I'm still happy even so. Does it really protect your phone. Yes it do. Thanks, I always try my best to buy the things from mobile phone at first place . And I am completely satisfied with the products and services. I’m really impressed with my product. Excellent. Perfect fit. Robust prtection. I do not use a screen protector with this cover. I find the genuine products perform the best. Had the same design for my note8 and was extremely happy with it: never needed to change it or use additional protection. You will scratch the front. The only place that I could find the blue colour. I love it. Great protection for my blue note 9. I received the package intact and in short time. I think that this phone case is amazing. I love the clear view and the fact that it helps to protect the phone. I have the Note 9 in lavender and it matches the phone also. The stand comes in handy when watching videos I also like that you can use the front as a mirror. All around 1 of the best cases ever for a smartphone. This case is beautiful and fits the phone tightly for a slim profile with protection. You can use it as a standing case and the front doubles as a mirror. You can see your notification through the front but it also adds privacy. I really love this case and it was definitely worth the money as it is well made. This is good stylish product but doesn't work with my wireless charger. You have to take off the case which fits pretty tight. So not ideal situation. But is expensive but worth it. Which wireless charger are you using? This case usually has no problems with wireless charging. The front cover whilst showing the always on display picks up scratches easily. I've had my one for less than a week and despite best efforts it already has several scratches on it. I've bought this product before so i knew what to expect. They've not changed the design from previous versions just the phone so i was happy to order it again as it protects the phone well and gives easy access to time,date and any other notifications you'd like to see. It's well made and takes knocks and bangs of everyday usage. Very nice cover that fits the phone well. Rather expensive for what it is. This cover fits like a glove. The cover is semi see through so you can see in coming alerts and messages. You open the cover and it turns the screen on without pushing any buttons. It works with my glass screen protector also. You can use the cover as a small stand so you can sit it in front of you on a table or desk to view movies with the need for it to lay flat. I have had several Samsung Note and S phones and used these covers on each one. I have never had any issues as far as quality or workman ship.